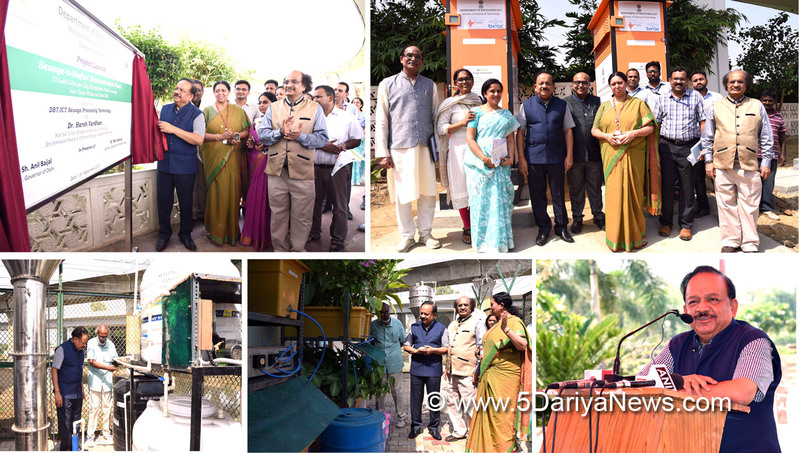 Union Science & Technology minister Dr. Harsh Vardhan today inaugurated a novel holistic Local Treatment of Urban Sewage Streams for Healthy Reuse (LOTUSHR) project at Sun Dial Park in New Delhi that produces clean water which is reused for various purposes, while simultaneously recovering nutrients and energy from the urban waste water, thus converting the Barapullah drain into profitable mines.Along with that, Dr.Vardhan also inaugurated two bio toilets supported by DBT-BIRAC and the Bill and Melinda Gates Foundation installed at the Sun Dial Park. This is an attempt to meet the goals set by the Swachh Bharat Abhiyaan and contribution of the Department of Biotechnology, the Ministry of Science and Technology to “Swachhta Hi Seva” movement launched by Prime Minister Narendra Modi recently.Speaking at the inauguration, Union Minister congratulated the researchers and scientist involved with the pilot project and said this plant is a unique example of how waste can be made into a profitable mine. Dr. Vardhan said that this plant, which can convert 10 lakh litre of sewage into clean water and generate 3 tonnes of biofuel ,will be scaled up and will become a model for example for the whole world. In another unique initiative at the site Department of Biotechnology has undertaken afforestation of marshy flood plains, degraded and unusable land and planted 2281 plant and tree species. These are from 44 indigenous species. This not only cleans the area, mitigates mosquito breeding but also purifies the air and soil. The species and the spacing of the planted material is carefully planned using a technology which allows these trees to grow rapidly and within a short span of two-three years recover a unique ecosystem of birds, insects and animals.The Local Treatment of Urban Sewage Streams for Healthy Reuse (LOTUSHR) project inaugurated today is a joint initiative of Indian and Dutch scientists. Around a year back DBT in consultation with DDA identified the Barapullah drain, Sarai Kale Khan, in the state of Delhi for setting up on-site experimental testing lab and for the establishment of a pilot plant. DDA leased to DBT, a land measuring 200 Sq meters for a period of 5 years adjacent to the Sun Dial Park for this purpose. The project at the site today demonstrates how science and technology can be leveraged to effectively turn urban waste into profitable mines.